If you believe the best things in life are free then you’ll love this issue of CB. We’ve added 32 extra pages to this issue of the mag and got our tech-head tipster and fixer Rick Parkington to edit a Buying Guide, covering British 650 twins. Sixteen of those pages are dedicated to Rick’s ramblings in the workshop of SRM, plus a road test on a rejuvenated A65 Hornet – while the remainder of the package is a guide to British bikes within the 501-650cc category. We’ve also made some changes to the mag, incorporating a new ‘Market’ section which focuses on buying and selling, with key personalities in the classic world offering their views on current market trends. We’ve introduced some new regular features:‘d’Elegance’, which showcases exceptional design and style, kicking off with Tamburini’s own 750cc MV Agusta; ‘At lunch with…’ featuring an in-depth interview with 1960s works Honda and Suzuki GP rider Stuart Graham; and ‘Collector’ – a look inside the workshops of those special individuals who accumulate vast numbers of motorcycles, starting with an Italian garagista and a horde of obscure smallcapacity enduro bikes. Other features include a look at the 1954 GP season when Norton were trying new aerodynamics to remain competitive with their Manx singles. And there’s our cover bike, the sublime Matchless twin café racer that’s been owned by the Dave Moeser for 50 years! 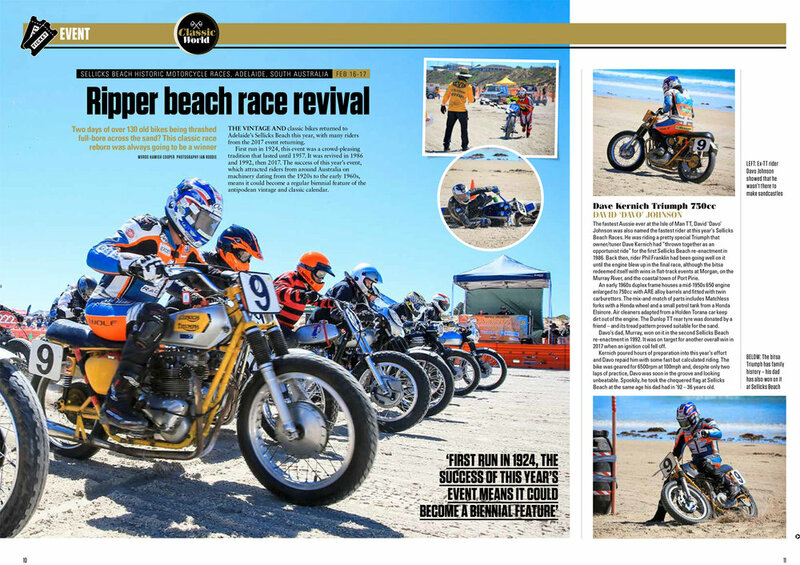 We’ve also got Ace Classics’ latest McQueen tribute bike – the Great Escape Triumph, as well as beach racing from Australia, and a restored pre-prod RD250 from Hungary. This issue has now sold out. To guarantee your copy, subscribe here!